Punica granatum nana is native to the area from Iran to the Himalayas. 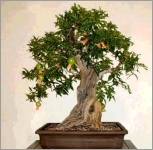 It makes a good candidate for bonsai because it gets a maximum of only 4 feet tall. It has a marvelous naturally-twisting style trunk that very easily adopts a gnarled, ancient appearance. The deciduous leaves start out the year bronzy, develop to a brightly shimmering green and end the year an attractive shade of yellow. The leaves cling to the shrub until quite late in the year, returning slowly in Spring. In subtropical areas, it is semi-evergreen, unlike the species generally, but entirely deciduous in North areas. It is not only small in stature, but even the flowers and fruits are dwarfed. Sweetly scented flowers and edible fruit in one. This showy, dense dwarf tree displays, at an early age, attractive orange-red "trumpet style" flowers from late Summer-Fall. Small fruits follow the flowers. The rounded fruit of the Dwarf Pomegranate is about two inches wide and red when ripe. Each fruit is divided into about half a dozen compartment. Each compartment contains many small seeds surrounded by skinny pinkish red flesh which is full of juice. The seeds are packed tightly together. It will bear miniature fruits if grown in areas with year-round temperatures that rarely fall below 40°F. But even if it never gets fruit, the flowers are quite beautiful.